Ever since Chevy Chase exhorted us to “be the ball,” golfers have been seeking the elusive “zone,” a place in the time-space continuum where physical ability has been layed aside and the mind conquers. Or perhaps the quest began when a shepherd first struck a rock with a crooked stick. Or perhaps this does not matter. What does matter is that someone has actually documented that chase, lived (in a keep-your-sanity sort of way) to tell about it, and actually come out on the other side as a golfer more focused on the spirit of the game. Josh Karp's most recent volume Straight Down the Middle: Shivas Irons, Bagger Vance, and How I Learned to Stop Worrying and Love My Golf Swing takes us on that journey. Let’s face it, every golfer is trying in some way, shape or form to lower his or her score. Golfers will try just about anything. They’ll listen to any piece of swing advice from virtually anyone, always searching for the magic that will drop the score even one or two strokes per round. But very seldom do they pay attention to the mental game. So, is it possible to transform one’s game and lower one’s handicap from the inside-out – increased attention to the mental game – as opposed to the outside-in – give a try to the latest and greatest swing tip? Karp sums up the thesis of his quest in Chapter 2 when he states, “…that the actual ‘playing’ of a round of golf occurs in roughly 180 seconds… What’s happening the rest of the time, where our mind resides during that time, is something we pay almost no attention to, yet which profoundly impacts our performance.” From this realization the pursuit is on. 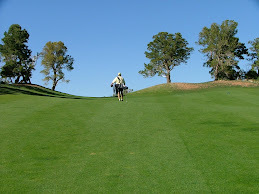 He goes from guru, to sensei, to golfing Buddha in an endeavor to find peace of mind in the mind boggling game of golf. As we travel with Karp we discover what seems like an endless number of golf instructors totally focused on the playing the game with just the mind and damn the swing. Not only does Karp tell us his story – the toils and the triumphs – but he also passes along some useful (at least to him) instruction and drills such as the Jug McSpaden drill (pgs. 61-62). He also presents us with an apt description of the relationship between golf and spirituality, the struggle to make the ball do what you want it to do through only the force of our will. How did all the senseis, gurus, Zen masters and whatevers help? Well, for one brief two month period beginning on August 8, 2008, Karp found himself in the zone … or whatever Zen golfers choose to call it. Golfing nirvana set in. But just as quickly and suddenly as it arrived, it was taken away by the ever vengeful golf gods. And how does it all end for Karp? Let’s just say he is at peace with his golf game.